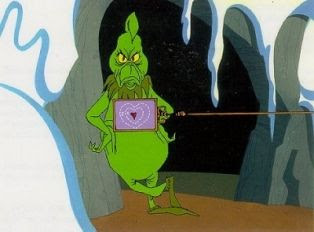 Yesterday Isabella made my heart grow three sizes just like the Grinch's heart. She climbed up on my lap and said "Thank you for taking such good care of me, I love you mommy." My twins have decided that their push toys are the bomb this week. Did you know that two kids on push toys rolling around on wood floors is just a tiny bit loud? I cut Mark's bangs (do boys have bangs or just hair?) for the first time this week. I did not do a good job. But at least his hair is out of his face. I'll text random family members saying-I think you should bring this poor mom a Starbucks-in hopes that one day someone will actually bring me one. I've never had a taker. Until Wednesday when my dear friend Amy brought me one. I was joking that she should start a Starbucks delivery business and I would be her first customer. I'm convinced that Starbucks should deliver since the thought of loading three kids in the car just to buy a $4 coffee never sounds like a good plan. Well not good enough to actually load them into the car. My little Molly has started licking the walls. She cruses around on her push toy and stops and licks the wall. It's weird, there is no nice way to describe this behavior. I make parenting mistakes daily all the time. But every now and then my kids do something that tells me that I must be doing something right. Like Tuesday when we went to Chili's for dinner (kids ate for free, thanks Chili's!) and this is what my kids had left. I must be doing something right since my kids ate all their broccoli but didn't finish the fries. Starbucks should, no they NEED to make a delivery service. I know tons of people who would use it, so they would definitely make a huge profit. I concur on the Starbuck delivery service. Or I could just use the coffee maker in my office. How sweet is your daughter. My heart would just melt. I haven't even tried to cut my daughter's hair. I knew I didn't want bangs to begin with but when her hair started growing much slower than I had planned, I started considering it. I'm thinking I'd probably have more serious problems than uneven bangs if I tried it - I'm talking serious injuries.